Forum thread by Welsh Chappie, started on May 18th 2013. 'Just thinking about the who LHR incident again. I have mentioned the idea that Zodiac may have been there on foot and listed several reasons why this theory is plausable. But today I have been looking over the scene and reports and noticed something that seems to suggest that if Zodiac was in a vehicle at LHR, it's unlikely that he parked his vehicle where the one witness said he saw a second vehicle parked. What we know for sure is this'. Another thorough examination of the crime scene at Lake Herman Road follows this premise. Visit the forum thread here. Forum thread by Quicktrader, started on November 11th 2013. 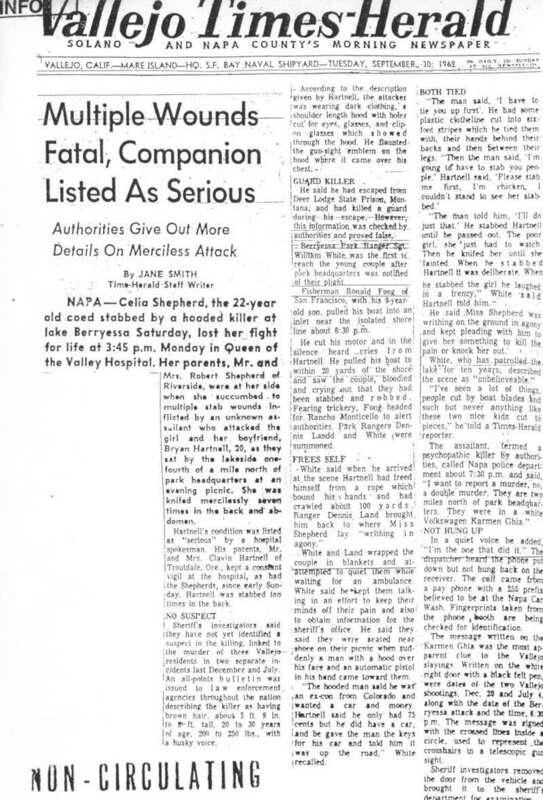 Quicktrader questions the crime scene at Lake Herman Road and the sequence of events on that fateful cold night back on December 20th 1968. This crime had no direct surviving witnesses to the crucial time period after James Owen passed the Lake Herman Road turnout and before Stella Medeiros arrived and discovered the bodies of David Faraday and Betty Lou Jensen. The only answers to the crime lay in the Rambler, the position of the two victims and the numerous bullets littering the gravel turnout. The killer had unfortunately disappeared into the night. This forum thread by jamesmsv on October 26th 2013 considers the possibility that the Zodiac Killer may have remained behind after his crimes, observing from a safe distance. It is not unheard of for criminals to hang around a crime scene and become the hidden face in the crowd. 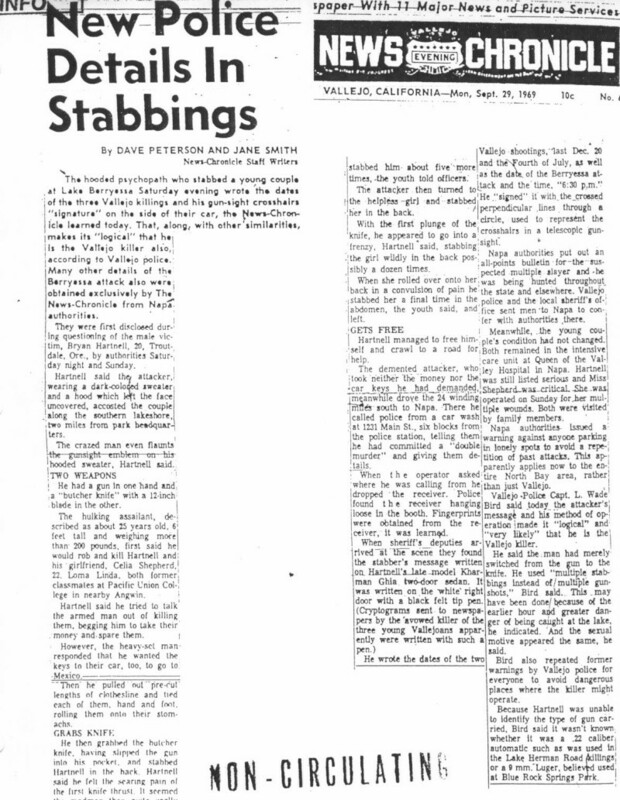 jamesmsv states 'I was thinking about Z's descriptions of the Presidio Heights police activities and it got me thinking - what was the crowd situation there'. To view the entire thread visit here. Posted on March 30th 2013, Morf13 initiated a forum thread based on a surviving witness to the Lake Herman Road crime scene. On December 20th 1968 the Zodiac Killer began his murderous campaign that claimed the lives of David Faraday and Betty Lou Jensen. Seven months later he sent three coded messages to three Bay Area newspapers to leave the authorities in no doubt they had a new breed of killer on their hands. One witness that night was James Owen, who drove past the isolated Lake Herman Road turnout, during the relevant time frame. Morf13 recently contacted James Owen by phone, to pick his brains and draw his recollections of the Zodiac case. The full transcript of that phone call and subsequent discussion can be found at ZodiacKillerSite forum.